Searching for a venue that accommodates your guest count and provides your must-have amenities might seem overwhelming at first. We've compiled this information for you so that you are one step closer to finding your dream venue! The Willow Farm is an exciting new venue proudly providing a quality location for your parties, weddings, and community events. It's timeless craftsman style lends itself to subtle elegance. The large open space is ideal for any event. Floor to ceiling windows allow for a majestic view of the lake. Turn of the Century working Ranch Museum. Offering ceremony and reception space versatile for any style or theme. Hold your next Wedding or Event on our beautiful historic grounds. If you are looking for a venue that is simply beautiful and relaxing all on it's own, book a venue tour at Bella Rosa Farms in Durham. Just a few moments outside of Chico you will feel like your are in your own oasis for your wedding day! We're so excited to see the Oroville Inn brought back up to it's former glory, and look forward to seeing many beautiful weddings and events held here. For more information visit their Facebook page! With lush landscaping and versatile indoor/outdoor space, The Palms feels like an escape from the city. One of the larger capacity venues in Butte County, with many amenities including tables, chairs, LED uplighting, on-site suites for the wedding party and serene setting to entertain your guests! 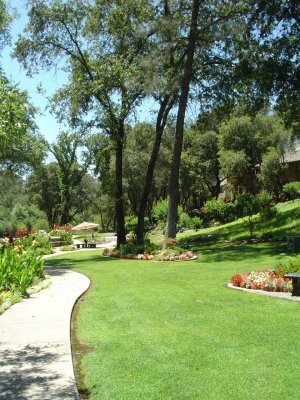 Located in the heart of Chico, the Creekside Rose Garden has over 200 roses, offering a beautiful setting for any event. We look forward to welcoming you! New Venue!! The Iron Gate Garden Inn property is perfect for the outdoor wedding surrounded by beautiful greenery. The onsite lodging for your wedding party or family makes for a relaxing weekend. Imagine your romantic wedding reception tucked away in a grove of trees under cafe lights. You can sip on local wine and enjoy a secluded wedding day at Gale Vineyards just a few moments outside of Chico. Canyon Oaks offers a versatile wedding experience for couples with indoor and outdoor space. In-house catering, venue coordination, bartending and tables & chairs are just a few of the great amenities included. Check your date with Canyon Oaks today! Stay tuned, we'll be adding more Butte County Wedding Venues shortly!